Guitar lessons are a great way to start music learning and it’s one of the more popular instruments at our schools in Cedar Park. At HitMaker, we love helping students learn in guitar lessons. We have students from NW Austin Cedar Park TX, Leander, Liberty Hill, Georgetown, and Round Rock coming here every week for the best guitar lessons in the area. Taking guitar lessons mean a lot of commitment and desire, like any other craft. We help our students to develop skills and ability by following a process. 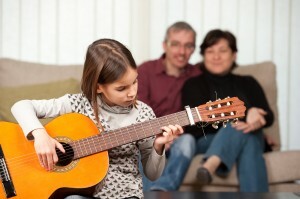 Our guitar lessons are designed to teach students the fundamentals of music. But, it has to be fun for the students. Our teachers encourage students to bring in their own song ideas. But first, we begin training on finger dexterity through scales and chords. Then, apply these skills to performance. The process of preparing for performance helps to motivate the students, we set short term goals with multiple recital opportunities throughout the year. Our music school has always rewarded our students for their success in music lessons. Gain confidence with guitar lessons. 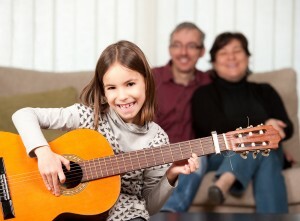 Students and their families enjoy the feeling of accomplishment and self esteem that comes with learning in guitar lessons. Students are proud of their progress, which helps in every aspect of their life including schoolwork, family and social situations, the list goes on. We develop student passion to play music by learning songs they love. 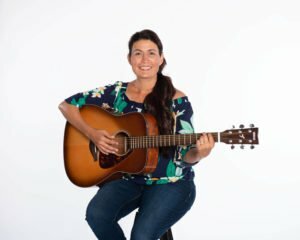 Of course, we have songs we would like them to learn, along with the repetition of fundamentals, and that means developing intrinsic motivation to learn guitar. Guitar lessons and learning to play guitar can take time. Usually, For most students, the beginning is the toughest time because the fingers are not used to it. However, with persistent practice much can be accomplished. For kids, 10 – 30 minutes of practice 4 days per week will yield good results. We offer superior music lessons in guitar, piano, voice, bass, ukulele, banjo and more in a safe, family friendly environment. Serving NW Austin, Cedar Park, Leander, Liberty Hill and Georgetown, and Round Rock, TX.